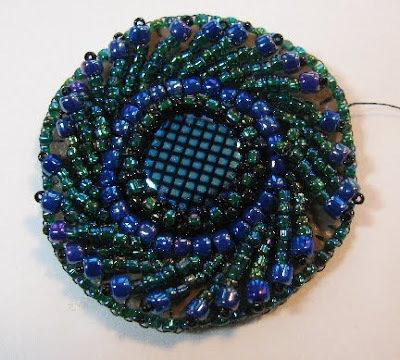 A free project from "Bored By Back Stitch"
For the last several years, I have been exploring how my favorite beadweaving stitches can be integrated with bead embroidery. The first step was to use some off-loom stitches as embellishments. 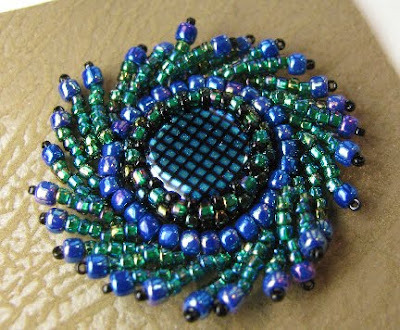 From there I moved on to using peyote, square, and right angle weave to attach embroidered components together. So what was next? Well, it seems so obvious now in hindsight: transform beadweaving stitches into embroidery stitches! But of course! 1. St Petersburg chain is a complicated stitch to learn, but oh so worth it! Once you master the rhythm of the pattern, you'll wonder why is seemed so hard at first. You can start with a bezeled or unbezeled focal of any size. I am showing this component bezeled; since it is a rather small component, the bezel adds considerably to the design. 2. Back stitch a row of size 8/0 seed beads around the bezel. I added 28 of them, but the exact count is not important for this stitch. 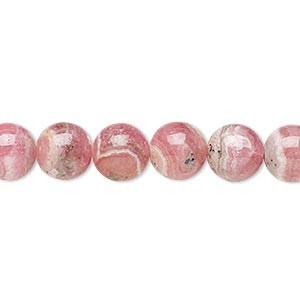 These will be called the base beads. 3. Work in whichever direction is most comfortable for you. I worked clockwise as viewed from the top. Exit one base bead. Pick up six size 11/0 seed beads and loop the thread around to pass upwards through bead numbers 3 and 4 a second time. 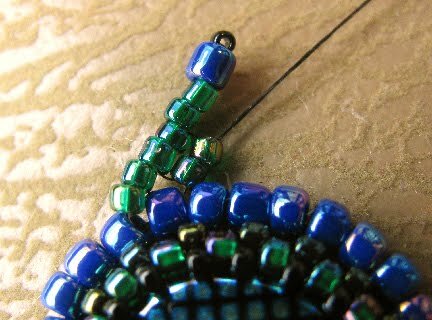 Keep the stitch tight down against the base bead. This maneuver will be called making a “flag” from now on. 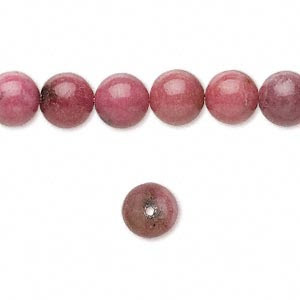 Pick up two size 11/0 seed beads, a size 8/0 seed bead, and a size 15/0 seed bead. Stitch back down through the size 8/0 and through five of the size 11/0s below it. Pass through the next base bead and up through the two unattached flag beads. 4. Pick up four size 11/0 seed beads and make a flag. 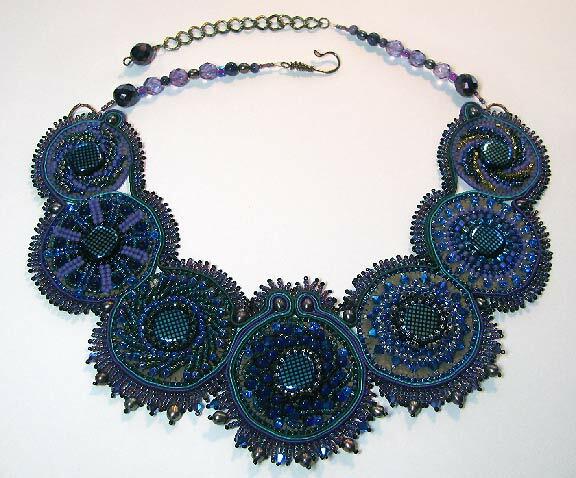 Pick up two size 11/0 seed beads, a size 8/0 seed bead, and a size 15/0 seed bead. Stitch back down through the size 8/0 and through five of the size 11/0s below it. Pass through the next base bead and up through the two unattached flag beads. Repeat Step 4 around. 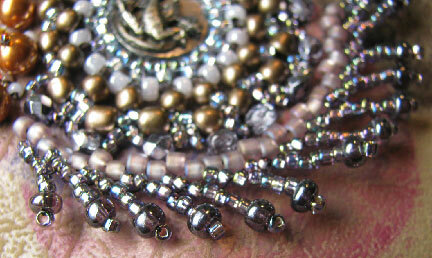 If your stitches begin to get too crowded for your liking, you can occasionally skip a base bead. I like it a bit ruffly, myself. 5. 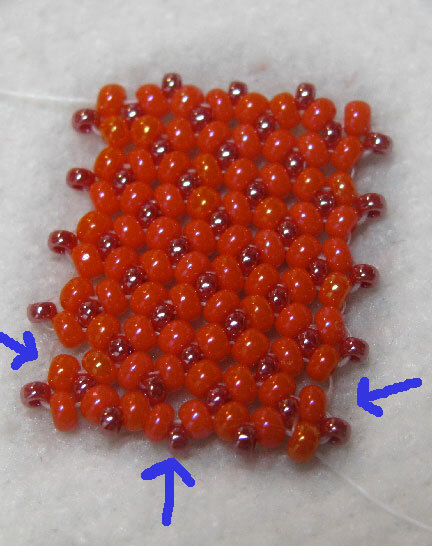 For the final stitch: pick up two size 11/0 seed bead. Stitch down through bead numbers 4 and 3 of the first stitch added in Step 3. Stitch back up through the two size 11/0s just added. 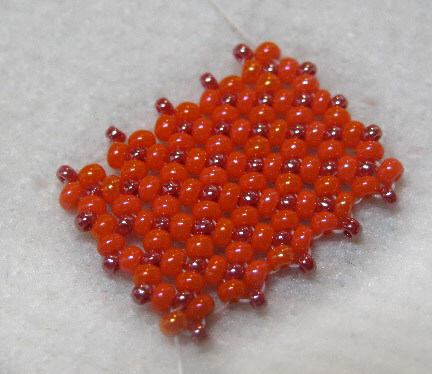 Pick up two more size 11/0 seed beads, a size 8/0 seed bead, and a size 15/0 seed bead. Stitch back down through the size 8/0 and through five of the size 11/0s below it. Pass through the last base bead, stitch through the fabric to the back and take a few small stitches to lock in place. 6. If you wish to make a small component, you can now clip the foundation fabric into a circle, attach a small piece of backing fabric, and use edging brick stitch all around the outside of the piece, stitching through both layers of fabric with each stitch. Leave the thread long after the last stitch so that it can be used later to join pieces together and add finishing decorative stitches to the brick stitched row. 7. After you've mastered the different stitches individually, you're going to want to try free form designs and mixing the stitches together. In this piece (above), I moved from a peyote bezel to RAW to African helix, and finally into St Petersburg chain stitch. 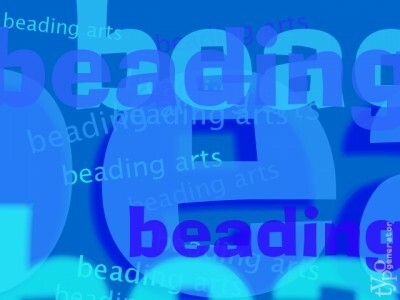 You can find all of my e-books, including the free first chapter of Every Bead Has a Story, at the link above! Copyright 2017 Cyndi Lavin. All rights reserved. Not to be reprinted, resold, or redistributed for profit. May be printed out for personal use or distributed electronically provided that entire file, including this notice, remains intact. heART beats from other blogs! 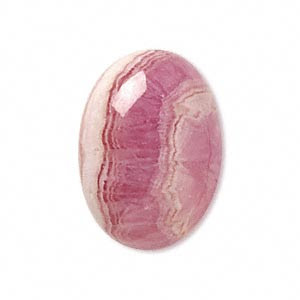 How well do you know your pink stones? 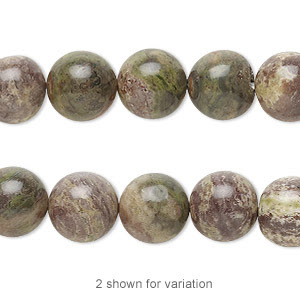 Can you tell which stone this is? There was a question asked online the other day which got me to thinking. Sometimes when we buy stones at a show, they may be mislabeled. Sometimes this is on purpose, in order to command a higher price. Sometimes it's through ignorance. 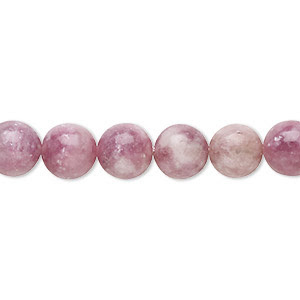 I can tell you right now that I have bought beads at shows that I know are mislabeled, but they were cheap and pretty, so didn't really care. Maybe I should have cared, and shouldn't have bought, but there you have it. I like to spend at least some time in the summer learning something new. I have not done flat chenille stitch before, although I have occasionally thought about it and have admired the cloth-like pattern it creates. It turns out, it's not hard! But it is tricky, and the tension is important. Once you get started, there are four rows that you keep repeating. If you have a problem with your tension, like I did here, you might want to think about planning on pulling out the first few rows when you're finished. But honestly, I think in the next sample I make, now that I understand how the rows work and can feel the rhythm of the stitch, I don't think these slack areas will even happen. You can find the instructions for flat chenille stitch in the August/September 2017 issue of Beadwork Magazine, in an article by Diana Balogh. You can also find instructions for the stitch, but not Diana's project, online at Interweave. Want to publish your own book? If you have some beads left over from another project, like these wooden beads in fun Summer 2017 colors, here's a quick and fun project that you can do to get more mileage from your purchase! 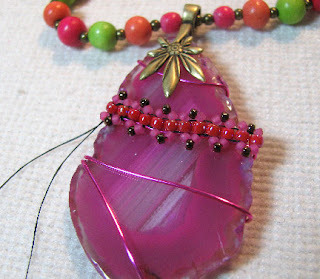 You can see the first project, a long statement pendant necklace, that I did using these beads at the link. 1. Leaving the C-Lon fiber on the spool, thread on your beads, starting and ending with the smaller ones. 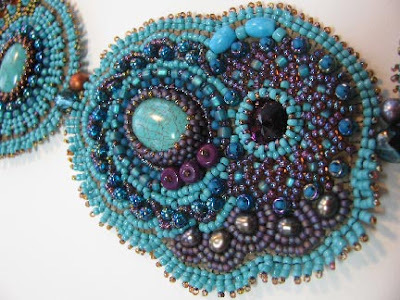 I used the 3mm metal rounds to break up clusters of the larger beads. To make a bracelet that would wrap three times around my wrist, I strung on about 17 inches of beads. 2. Start your bracelet with a 10 inch fiber tail and a couple of chain stitches. Push one bead at a time from the string up towards your hook. 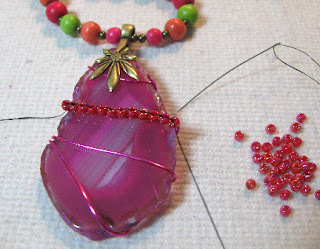 Do your next stitch on the other side of the bead, plus take one more stitch. 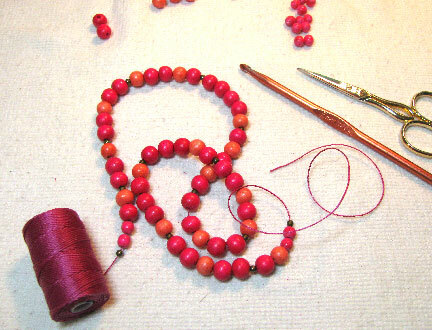 Push up the next bead and continue through the whole string, always working towards the spool. Once you reach the end, tie a knot, but leave the fiber attached to the spool. Wrap it around your wrist to check for length. 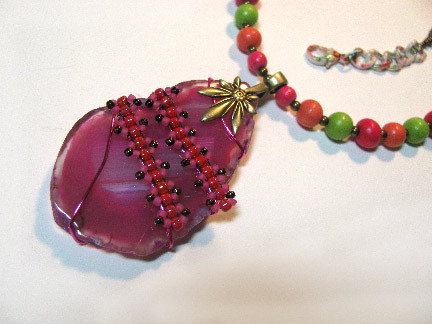 If need be, you can add a few beads to either end and lengthen it a bit. Once you've checked the length, reinsert your hook in the tail end and chain enough stitches to create a loop that will fit over your button. Tie a knot and dab it with cement. Let it dry before you trim the end. For the button end, cut the fiber from the spool, leaving yourself 8 inches or so. Work the end through the button as many times as you can for security. Tie off, cement, and trim as before. 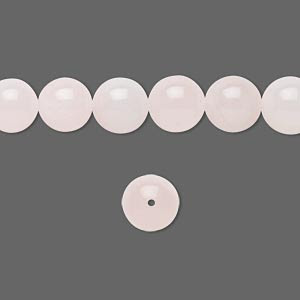 As regards FTC disclosure guidelines: I have received the above products free of charge from Fire Mountain Gems in order to create a project free of charge for you. Chain maille jewelry: it's all about the units! Single earring - a hot trend for Summer! One of the trends shown all over the runways for this Spring/Summer season is the single earring. Most of the runway models were sporting extra-large dangly and multi-colored earrings, but my suspicion is that extra-large may only be for show. Your earrings don't need to be seen from across the room. But by all means, interpret this trend as you choose. I have often worn mismatched earrings, either with of without a size difference from one ear to the other. I have four holes in each ear, one of which is at the top, so I've got enough real estate to play around with! I like earrings that are long and thin or short and wide, but not long and wide, so here is my interpretation of the trend. I would wear it with a simple stud earring on the other ear. 1. Cut out a piece of circuit board and file/sand the edges smooth. I deliberately picked a spot that already had a hole, but you may have to drill one or add a drop tab if there isn't one already. 2. 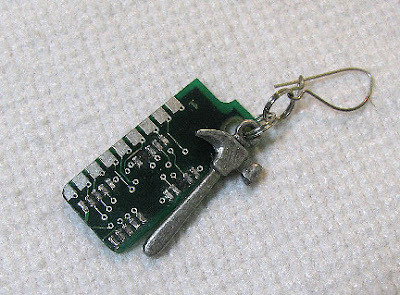 Use one split ring or jump ring to attach the hammer to the front of the circuit board. 3. Add another split ring to the first, and add an ear wire. What are styled shoots, and how could they help you build a business? Last week, we looked at one of the season's hottest trends with the best of the season's colors - a statement pendant necklace. We went through the steps of putting the basic necklace together, and today we're going to look at an easy way to fancy-up the pendant itself. You'll find the complete materials and tools list in last week's post (link above). 8. 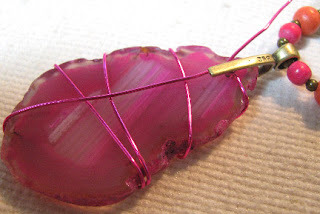 Cut 16" (or more, depending upon how many wraps you'd like) of the pink 20 gauge wire. I found it convenient to wrap it around the bail post in the back, that is, the part that sticks into the drilled hole of the agate slice. From there I wrapped it several times around the slice, moving towards the bottom, and then finally brought the wire straight up the back to wrap it a few more times around the bail. Clip off the excess wire. 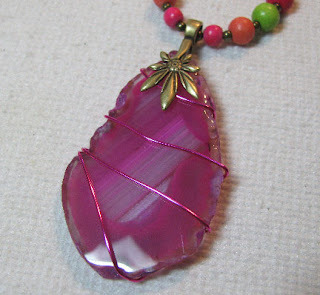 Don't worry that your wrapping around the agate may be loose. 9. On the front (and the back too, for that matter), grab the wires carefully in a few places with the chain nose pliers and give a gentle twist. This will tighten up the wires. Be very careful not to chip the finish on the wire. You can use nylon jaw pliers or wrap the jaws in masking tape temporarily if you'd like. 10. 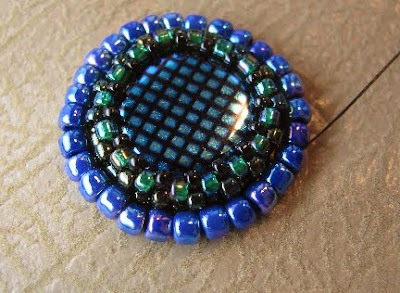 Using Nymo beading thread, tie it to one of the wires you'd like to decorate, leaving a tail of about 4 inches. Add size 8/0 seed beads along the wire using brick stitch. 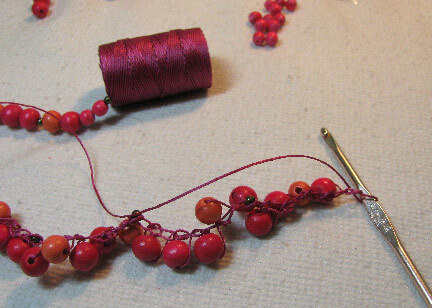 You'll have to add two beads for the first stitch, and then one bead for each following stitch. Make sure you have an even number of beads when you finish. 11. Add picot stitches at both the top and the bottom of each size 8/0 seed bead. 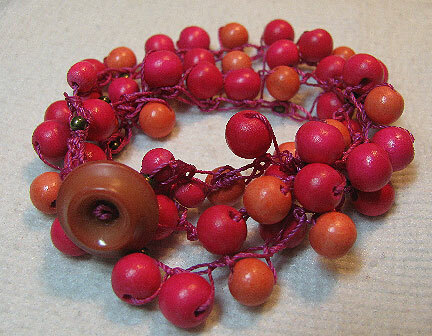 I used three size 11/0 seed beads, in matte pink and iris bronze. Tie off the end of your beading thread. Use a small drop of Hypo-Cement to seal the knots. Work each thread end back through a few stitches and tie off again. Dot with cement, and once it is thoroughly dry, snip the thread ends close. 12. Decorate as many of the wires as you like. 13. 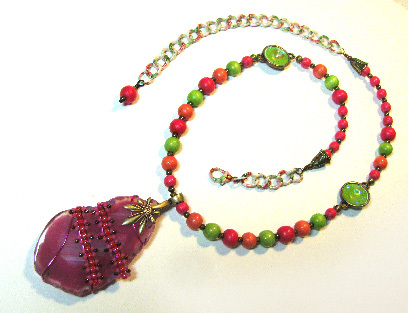 The chain and clasp make this an adjustable necklace. Once the trend of wearing them long has passed, you'll be happy to find you can still wear your necklace shorter!